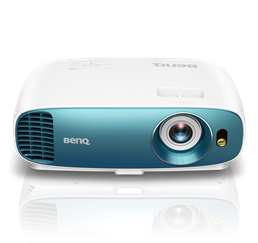 New Delhi, May 10, 2018 – BenQ, the global No.1 DLP projector brand, today launched the Home Entertainment TK800 DLP projector offering the truest 4K big-screen experience. Giving today’s families an experience of heart-pounding 4K UHD sports action and movies in the comfort of well-lit living rooms, the HDR10 enabled TK800 DLP Projector is designed for brighter viewing spaces. Aimed at appeasing sports enthusiasts around the world, TK800 delivers breath-taking picture quality, custom-tailored sports mode, and comes with an easy setup flexibility with modern style. Featuring true 4K 3840x2160 UHD resolution with 8.3 million distinct pixels, TK800 produces stunningly lifelike realism utilizing projector-optimized HDR to enhance brightness and contrast range with one-step image optimization and automatic HDR natural color rendition. TK800’s innovative 4K color wheel achieves 92% of Rec. 709 color gamut in conjunction with 3,000 lumen high brightness for awe-inspiring projected picture quality in bright environments with ambient lighting such as living rooms and backyard parties. Fully capturing the excitement and thrills of watching live sports, TK800 offers dedicated Football and Sport audio-visual modes to deliver experiences as if viewing in person. Football Mode preserves natural skin tones while intensifying lush green grass, simultaneously clarifying the announcer’s commentary among the cheering crowd of an open-air stadium. Sport Mode also prioritizes realistic skin shades while enhancing wood tones and vivid reds along with balanced greens and blues for indoor sports, with clear acoustical quality for the announcer’s voice and details such as squeaking sneakers, referee whistles, and ice scraping under skates. TK800 comes with an industry leading lamp life of upto 15000 hrs which is first time ever in any Home entertainment Projector. It is also supported by a 2 years onsite warranty across India for a complete peace of mind. TK800’s CinemaMaster Audio+ 2 sound system is newly upgraded with a significantly wider frequency range and 5-watt power, utilizing sophisticated materials such as an aluminum driver diaphragm and resonant sound chambers for delicate details, pure vocals, and resounding bass. A true 4K DLP projector with high brightness for the living room, the sleek and compact TK800 blends beautifully into any décor simply and conveniently with auto keystone correction and 1.2X zoom flexibility to accommodate any space. Powered by ultimately durable Digital Light Processing, the 2015 Academy Award of Merit Oscar® winning technology used in 90% of the world’s digital cinemas, TK800 delivers long-lasting picture quality with precise colors and razor-sharp clarity without maintenance or degradation.